I was on duty at my stand at the London Boat Show in January 1971 when I was approached by my two friends Roger and Philip. They had dreamed up the idea that we should sell our respective small plywood cruising yachts and together form a syndicate to purchase a larger deep-keeled yacht. The initial choice was discounted, the accommodation being a little smaller than required, and the builder was, at that time, known to be in financial crisis. Although slightly above our budget we had always liked the look of the Cutlass 27 and, after much discussion, decided to embark on what appeared to be quite an undertaking. Despite not having had any previous experience of boatbuilding, the decision was reached. We would buy the hull/deck moulding and kit of wooden components, and build her ourselves. The day before Good Friday, the moulded hull etc, was delivered to Deacons Boatyard. With much excitement, initial hours were spent propping her up to ensure that she was dead level before taking the frightening first step, which I remember as drilling the starboard cabin window before jig-sawing around the moulded outline. Thus it was that Easter that year was spent carrying out one job after another. Indeed every spare hour throughout the summer of that year was spent on one job or another. As it was possible that two or three families might want to cruise together, extra accommodation was required. I therefore set about designing and building a quarter-berth on the starboard side, bringing her sleeping accommodation up to a comfortable five. 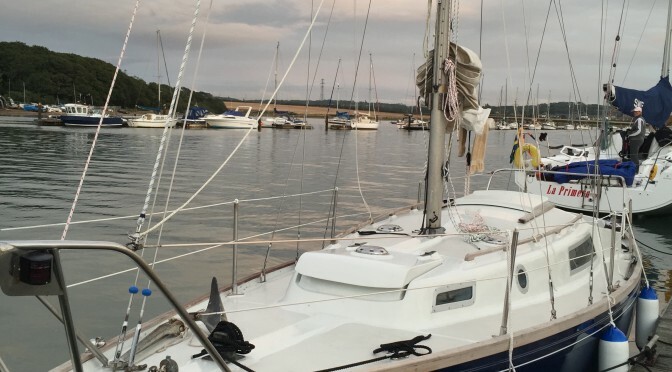 Mast, spars, sails, winches, and a myriad of items gradually were delivered and fitted, the yacht registered, and by the end of July she was just about ready to launch. The galley was yet to be fitted out properly, but in the first week of August, Deacons moved her out from the shed, stepped the mast, and she was launched into the waters of the Hamble River, whilst we looked on with much undisguised pride at what we, mere amateurs, had achieved. Having spent so much time working on the building of Windchat we decided that we deserved a holiday cruise after initial trial runs in the Solent. The galley could be finished off later. The choice of destination was Guernsey in the Channel Islands. Thus it was that, after an overnight stay in Yarmouth, and with a force 4 North Easterly forecast we set off in the evening to make an overnight passage. All was well until I was woken in my bunk at about 2am by crashing noises up on deck, and the realisation that the sea seemed much heavier than expected. I quickly discovered that the noise was that of Roger lowering the mainsail in a hurry, lowering the genoa, and replacing it with the jib. The wind being from aft, the jib kept slapping from side to side so I altered course to south-south-east which quietened the sail down. I had intended to, in effect, tack downwind, our intention being to round to the west of Alderney Light. By first light we realised that the forecast had been seriously wrong and that we were running before a full force 8 gale. Not only that, but I had forgotten to alter course as intended, and, expecting to see Alderney on our port side, the island appeared on the starboard. We then realised that we were at the top of the infamous Alderney Race, in a gale force wind, with wind against tide – horrendous. Rapidly altering course we sailed along the northern shore of Alderney with waves that seemed as high as the crosstrees. Watching the waves crashing on the cliffs of the island as we careered at frightening speed down the face of each as it overtook us was pretty awe-inspiring. Thank God we were at least some two or three miles offshore. The amazing thing was that, as we hurtled westward, I was wringing out wet socks etc. and hanging them on the guardrail to dry. All of a sudden confidence in Windchat replaced anxiety. Rounding the Alderney Light we headed down to Guernsey, sailing round the western side to St. Peter Port where we arrived at 1600hrs. on September 4th. 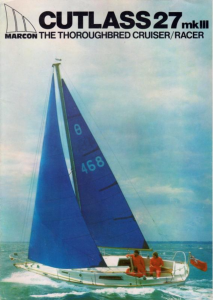 Roger secured the mooring and collapsed on the foredeck whilst I fell asleep in the cockpit – both still in oilskins. Philip had unfortunately been violently seasick since early morning and could not wait to get ashore and book himself into an hotel. The next day was my birthday and the harbour launch arrived with a greeting telegram from my my wife Marguerite, who later travelled out to join Roger and I as we spent days lazily sailing around Herm and Sark before crossing the Channel for home. So ended the maiden voyage of Windchat. 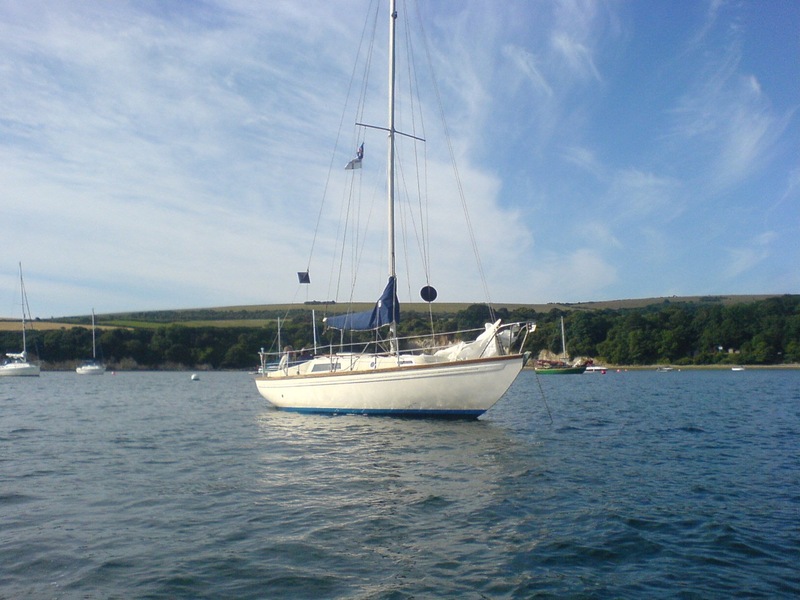 She was to carry us on many cruises to Salcombe, Dartmouth, Newton Ferres, Falmouth, Helston, two cruises to the Veersemeer and beyond in Holland, via Dunkirk, Ostend, Flushing, and Calais. Of all the things that I may have done in life, building Windchat has always given me such a sense of achievement and pride. To me she is more than just a boat. She is beautiful to look at, a delight to sail, and thoroughly seaworthy. You can imagine how I feel about my son Peter taking over the helm and having her restored to full glory by Deacons Boatyard, where it all started. May she sail the waves and give pleasure to all who board her for many years to come!